A disproportionately large number of Phang Nga Province's English-speaking residents were killed in the tsunami, particularly in beach-resort areas such as Khao Lak. Local leaders strongly believe that children will benefit greatly both from the confidence gained through the multicultural experience of English-language education and the increased potential for future employment opportunities. 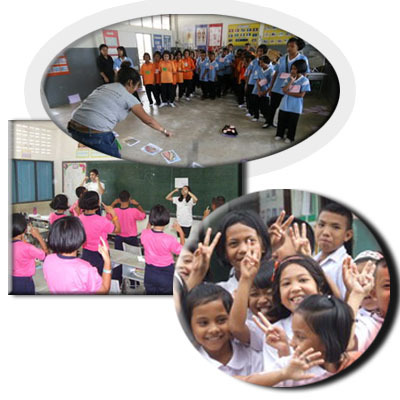 In Mid-January, less than two weeks after the tsunami, the Tsunami Volunteer Center responded to the community's need for child service programs by establishing English Education Outreach in three area schools. With levels of involvement varied depending on schools' needs, the Center's role includes teaching and supporting staff with course development and grant proposals. 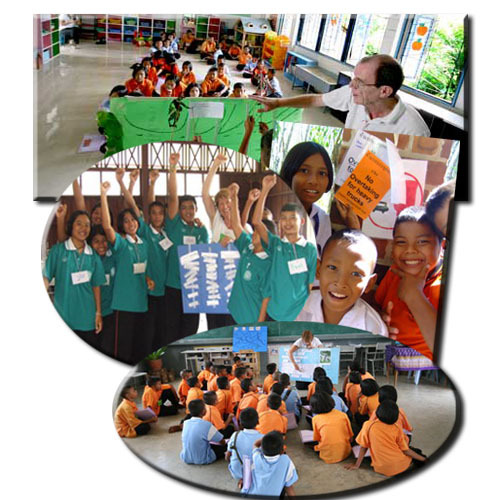 This Project has been a major component of our volunteer work this year as our staff and volunteers developed exciting english educational programs and taught English to both Thai and Burmese children in schools as well as to the hotel staff in selected areas: Takau Pa, Tai Maung and Ka pong in Phang-Nga province. We strongly feel that the local children should start learning basic English from a young age so they will be able to communicate confidently with many others, increasing their employability, especially in the tourism area.